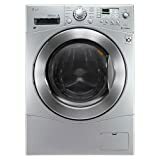 LG's VENTLESS all-in-one washer and dryer combo does it all in just one machine. 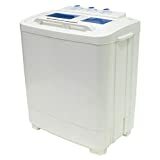 It's great for those who want to be able to do laundry at home but do not have an external venting source which conventional dryers require. Perfect for homes, apartments, businesses and vacation homes where space is valuable. This washer/dryer combination fits in the smallest of spaces while providing the perfect solution for those consumers who require in-home laundering without the capability for an external venting source. Despite all of this, our washer/dryer combo still offers an energy-saving, variable spin speed up to 1200 RPM. The biggest advantage of this unit is its ventless drying cycle, which does not require a vent. Please understand the delivery man will not set up and put the unit into your house, it will only do curbside delivery, and they do not go upstairs and steps. Freight shipment is very expense, if you simply refused the shipment, or if they can not get hold of you, they will send the item back to us, they will charge us the return shipping fee, if that happens, we will refund you minus the $300 shipping fee for both ways.